Sales reps don’t always hit their quotas. In fact, 43% fell short of the mark last quarter. But figuring out how to keep the big sellers on track while boosting the less-successful half of your sales team can be tricky. In this expert e-guide, discover insights into the sales process and learn how more organized management can help you bust quotas. 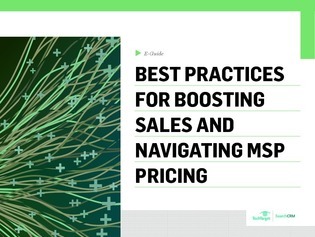 Also, explore the methods managed service providers leverage—both homegrown and commercial—that help them nail down their pricing calculations.